Absolutely. We are available from 9:00am-4:30pm (UK time) Monday to Friday, and will happily process your order over the telephone if you’d prefer to place it this way. You will be asked for payment details, so please have these ready. Can you amend my order? It may be possible to amend your order if requested early enough, particularly if it involves removing an item or choosing a different style. You should contact Customer Services as soon as possible on 020 8050 8060 or at support@mrsbowtie.com (please note our opening times). Can you amend my details? If you would like us to change your telephone number, email address, or delivery address, please contact us as soon as possible, by email or telephone. If you would like us to change the billing address on your order, please email support@mrsbowtie.com asking to have these details changed. Please include your full name, order number and the correct billing address. Please note that details can not be changed after your order has been dispatched. However, if you have entered the incorrect delivery address and your order has been dispatched, we may be able to contact the courier and have this changed for an additional fee. To do this, please contact Customer Services. All orders are handmade to order, and are processed in accordance with the shipping option chosen. If you selected the shipping option "WITHIN 5 BUSINESS DAYS", this means we aim to get it to you within 5 business days. "Business Days" refers to Monday - Friday in the United Kingdom, excluding public holidays, though Business Days may be slightly different in the delivery location, for example in the United Arab Emirates, where "Business Days" are Sunday-Thursday. It is important to note that we dispatch orders with enough time for it to reach you within the selected time, but once it has left our premises and is in the courier's possession, we are not in control of the order any more and some delays may occur due to such things as weather conditions and local disruptions, and we cannot be held accountable for these delays. Within a few minutes of placing your order, you should automatically receive a confirmation email from us that details your recent order. If you do not receive this, please be sure to check your Spam/Junk mail folders in case it has been delivered here in error. If you still do not see a confirmation email from us, please contact Customer Services on 020 8050 8060 or at support@mrsbowtie.com to confirm your email address and resend the confirmation email. Do items come in a box? Yes, all items come inside branded presentation boxes. 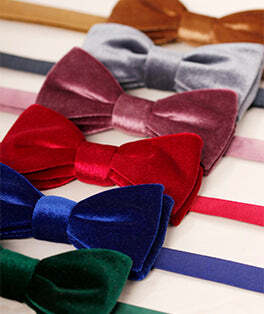 Children's bow ties come with branded packaging, but not inside a box. Please note that some exclusions may apply, specifically for reduced stock, clearance stock, and Outlet stock. It is unlikely that products inside Mystery Boxes and Mystery Bundles will be individually boxed. If returning items, this presentation packaging must also be returned in re-usable condition. Can I receive my order without packaging? Unfortunately, we cannot fulfil this request. The packaging is essential to ensure that the product remains undamaged from the time it leaves us to the time it reaches you. Couriers will not accept responsibility for any damage caused during transit, and we never want our customers to receive items that aren’t in the same condition they left us in. We’re sorry you’d like to return your item, but understand sometimes it just isn’t what you’re looking for. We will happily accept items back for a refund, but we ask that you first read our Returns Policy (we know it’s boring, but it will explain a lot). If you are happy that you comply with the conditions outlined within this, please complete the Returns Request Form included in the webpage and submit it to us. We will then authorise the request and send further instructions on where to return the goods to. Due to our extensive range of products and internal manufacturing process, we don't currently offer exchanges and advise that you return your item for a refund and place a new order. However, if you would like to exchange one product for another of the same price, we may be able to offer Store Credit (a virtual gift voucher) that you can immediately use towards your next order rather than wait for funds to return to your bank account. If you wish to do this, please contact Customer Services. Please allow up to 10 working days for your refund to be processed. Once we issue your refund, your bank/payment provider may take up to 28 days to deposit funds to your account. Can I return my order without the packaging? We require all items to be returned with original packaging. The packaging is designed to protect the product in transit, and as couriers will not accept responsibility for any damage caused during transit, we wouldn't want anyone to have their refund denied for a damaged product that wasn't their fault. If we receive items without their original packaging in reasonable re-usable condition, we withhold the right to deny any refund based on disregard for our Returns Policy, if necessary. Absolutely! We have a lot of international customers. Unfortunately, due to circumstances out of our control, there are a number of countries and locations we do not deliver to. The reasons for this can range from high customs charges to economic sanctions. For a full list of countries we ship too, please visit the Shipping Information page. You will receive a dispatch notification when your order has left our premises. If you have not received this, please check you Junk/Spam emails to check it has not mistakenly been sent there. If you still can’t see the email, please contact Customer Services on 020 8050 8060 or at support@mrsbowtie.com. Domestic orders (Great Britain) are sent using either Royal Mail or FedEx. Orders to Northern Ireland, the Channel Islands, the Scottish Highlands and some rural Scottish areas will be sent with Royal Mail. All international orders (this includes Republic of Ireland, and EU members) are sent through FedEx. What happens if I'm not available to sign for my parcel? All order are sent with tracked shipping* and must be signed for upon delivery. If you are not available to sign for your parcel, couriers may acquire a signature from a neighbour, concierge, or other person at your address, such as a colleague or receptionist. By placing your order, you accept these terms & conditions. Any disputes or complaints must be raised with us within 14 days from the date of dispatch. *some smaller UK orders might be sent via Royal Mail without tracking. For security and tracking, we require all our parcels to be signed for upon delivery, so parcels can't be left in a safe place unless you have arranged this with the courier yourself. At the moment, we are exclusively online. We do have a number of retailers around the world that stock our products, but these will often be a small number of designs. Are your products really made in England? Absolutely. British manufacturing is at the core of our business, and all ties, bow ties, braces, cummerbunds and pocket squares are made on-site in the southern county of Hampshire. Our scarves are made in the UK by a third-party company, and even our packaging is made in the UK. A number of our cufflinks are manufactured outside of the UK, but we are always on the look-out for a British manufacturer who can produce these for us. If you are attempting to use a discount code that you have found on a third-party website such as coupon sites, you may be disappointed to learn that almost all of those codes have expired. An example of this is the code "SPOOKY30", which was valid for a few days for Halloween 2015, but is often still posted by voucher websites as a valid working discount code. All of our products come individually boxed inside branded presentation boxes that have been designed for gifting. We don't offer any additional packaging or wrapping options. I have a media / PR / advertising enquiry, who do I contact? I have a wholesale enquiry, who do I contact? For all wholesale enquiries, please contact enquiries@threadster.co.uk with full details about your company/brand/organisation and the type of wholesale order you’re looking to place.